Hello and welcome! It's Kathi hosting the blog today. It is the first Friday of the month and that means it is time to reveal the June Challenge. 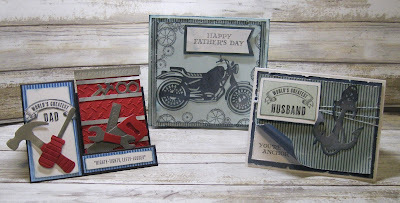 This month our theme is... Masculine Cards or Projects! Be sure to stop back at the blog this weekend for the Challenge Winner Announcement for Friday Challenge 75 - "Mothers and/or Mother's Day". I have created three masculine cards for the guys in my family. Card 1 - 4.25" x 5.5"
On card one, I used Mulberry Paper line QQP-MB101 on a black base card. The tool chest was created with red and silver paper. I placed the red card stock into an embossing folder that looks like a metal grate. The tools was cut using silver paper then ran through the die cut machine cutting with red card stock. They where then trimmed down to just the handles of the tools. I then ran them through the Big Shot in an embossing folder. I stamped the sentiments with archival ink distressing the edges with Royal Blue PowderPuff Chalking Ink. Layering the tools at the bottom of the tool chest and added the hammer and screwdriver under the sentiment. Card 2 - 5.5" x 5.5"
Card 2 features a light sea foam card base. They were then edged with Navy PowderPuff Chalking Ink. The motorcycle was die cut using the same paper line and used the PowderPuff Chalking Ink to highlight the areas of the motorcycle. The edges of the lighter paper with a gears stamp. A sentiment was stamped on white card stock distressed with Navy PowderPuff Chalking Ink, layered on the patterned paper. Card 3 - 4.25" x 5.5"
the card base is a white card stock, layering two pieces of the paper line with the edges distressed with a distressing tool. I wrapped bakers twine around the top 1/3 of the card layering the sentiment and a large anchor. The top paper was curled up exposing a sentiment underneath. The top sentiment was distressed with the Navy PowderPuff Chalk Ink. We hope you are inspired to join us this month for our challenge! We can't wait to see what you create!!! This month's challenge theme is "Masculine Cards or Projects". Create a layout, card, tag or off the page project that in any way has a masculine design featured - be creative! Use the Link button at the bottom of this post to link up your project. Great DT projects and my apologies for my entry as I had only intended once and computer issues gave you several of my same project!!! I love the DT projects. Sorry that I entered my card 4 times. I just couldn't get out of the Linky-site.